In preparing to write this blog, I decided to take a look at presentations I have given over the last ten years to see what is still relevant and what has changed in the way we approach educational technology. There are some very interesting nuggets to be gleaned. Does anyone remember digital natives and digital immigrants? Coined by Mark Prensky in 2001, these terms sought to differentiate between those who were raised in the internet age, and others who immigrated to the new reality from an older paradigm. I always disliked these terms, with their implied ageism, but they did highlight a point in time when technology was truly new for many populations around the world. The terms were widely adopted by educators in their strategies for training and development. You don’t hear these terms mentioned anymore. It would seem that technology has become so ubiquitous as to render the distinction meaningless. However, back in the early 2000’s, much of our concern was technology adoption—somehow how to convince the unwilling that using new digital tools was helpful and could transform education. Building upon the assumptions underlying Prensky’s digital personas, there emerged a number of technology adoption models. 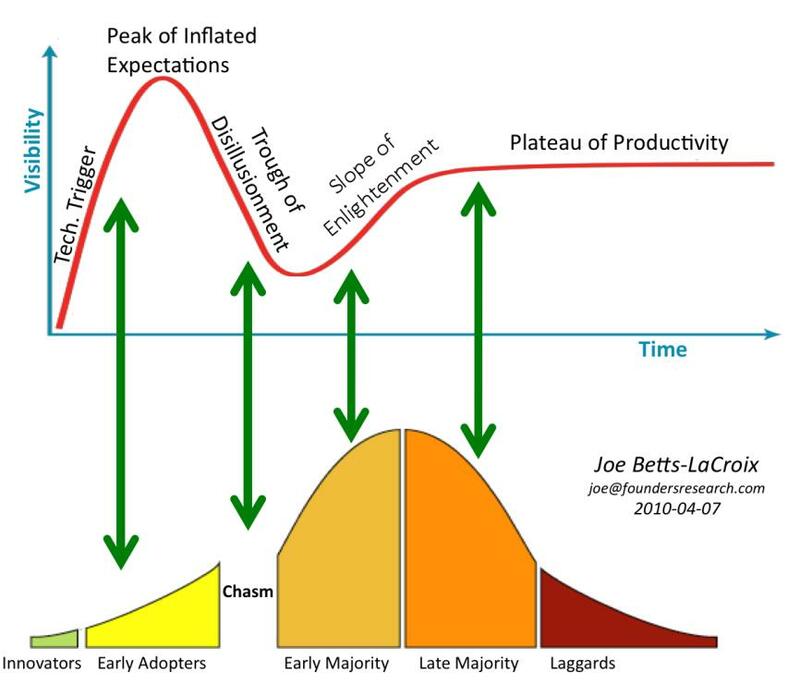 Two of the most widely discussed adoption cycles can been seen in the mash-up below. On the one hand we have a path to enlightenment, while on the other hand the goal is to push the majority to follow a select few pioneers—pretty much the same goal, just worded differently. Both cycles are characterized by a distinct curve which reflects a belief that existing teachers have a training deficit, and that once this deficit is compensated for, technology will reveal its true power. If I were to design these models with today in mind, they would look a lot different. First of all, the curves would be much flatter. Today, most teacher training programs fully integrate technology into their curriculum. The focus is not as much on re-tooling established cohorts as bringing up a new generation from day one. This same thinking would also eliminate the distinctions in the second model. With technology integrated in all training, there is no ‘convincing’ to be done here. Technology is part of the job. Arguably, today there would only be three groups: innovators, the majority, and laggards. Looking at these issues more than ten years on, I think we can point to great success in mainstreaming technology. Adoption really isn’t an issue anymore. For all intents and purposes, technology has become pretty much invisible in most of our daily teaching and learning lives. It’s simply there, much like pencils and paper. This does not mean we do not have great challenges. While some may take a utilitarian approach to technology and approach it as a tool to help make teaching and learning more efficient, for many the true power of technology lies in the potential not only to improve how we currently teach, but to transform it. If adoption is also defined in terms of transformation, then we still have a lot of work ahead of us. This is reflected in a number of technology models, most notably by SAMR, a model introduced by Dr. Ruben Puentedura, which looks at technology adoption in phases starting with substitution, moving on to augmentation, followed by modification, and finally culminating in the redefinition of the learning experience. The SAMR model lines up quite nicely with Bloom’s taxonomy, moving from the simple to the complex and transformative, and like Bloom’s taxonomy, getting to the highest level is a tough hurdle to take. In my experience, in language learning, I think we have struggled to make technology transformative—and maybe that is because we are looking at things the wrong way. Technology by itself doesn’t transform anything—people do. When you think about it, the challenge isn’t really about technology at all, but simple good teaching practice. If we are able to change our beliefs about education in general, then, and only then, will technology have the power to transform. In fact, I see an inverse relationship between the sophistication of current technology tools and pedagogical innovation. In my area of work, language teaching, new technologies do not appear to be transforming education as much as masking traditional models, especially rote practice- or what we like to call drill and kill. Shooting balloons with vocabulary items in them, or translating sentences against a clock, are modern versions of very old methods. A pig in a dress is still a pig. So where are the opportunities? What can technology do help us improve our teaching and learning? One area where a machine can clearly help us is in analyzing large amounts of data. The ability of machines to help interpret learning data and make recommendations holds out great promise for the future. Educational technology as a dynamic assistant, which nudges and suggests and even creates, but at our behest and with an on/off button. We have a lot of very intelligent people using technology, but not a lot of technology I would call intelligent. Changing this is the great challenge and opportunity for the future.